How the humble meat pie became more Australian than a kangaroo sandwich. Some things are even more Australian than the people who inhabit the Land Down Under. Icons of Australian culture include the sublime meringue dessert that was created for the visiting Russian ballerina Anna Pavlova; the battered Holden ute, workhorse of the outback; and the stylish R.M.Williams boots that can be seen tramping across many a stretch of sunburnt country. But close to the heart of this walkabout nation nature is the famous Australian meat pie. This handy handful has fed generations of sport-loving locals and no footy match is complete without it. But what exactly constitutes the ultimate meat pie, and where can the Crème de la Crème of this gourmet taste experience be found? Go west, young man! The ultimate meat pie can be found a five-hour drive northwest of Sydney, in the outback town of Dubbo, New South Wales. The Village Hot Bake Bakery Café is the centre of the universe for pie lovers. Run by the Stevenson brothers, Bill, Robert and John, these third generation pie makers recently scooped the coveted title of Best Pie Makers in Australia for 2005 – and not for the first time, as they also earned this national accolade in 2003. On their father’s side “Aussie” Stevenson started his bakery in 1918. Aussie was known as a great bread maker and supplied the local army camp for many years. His eight children worked in the family business, and in those days the bakery products were delivered by horse and cart. John remembers growing up in the bakery. On their Mother’s side of the family was their Greek grandfather Nick Kosseris, who was well known for his pastries. Both sides of the family were extremely proud of their products and in fact both families owned bakeries in Dubbo at different times in its history. It seems like fate that the three brothers were finally able to acquire their father’s shop again in the ‘90s and set up their own brand of bakery, which in recent years has gone from strength to strength. But what constitutes a great Aussie meat pie? And what does it take to win the accolade of Best Pie Maker, not only once, but twice? 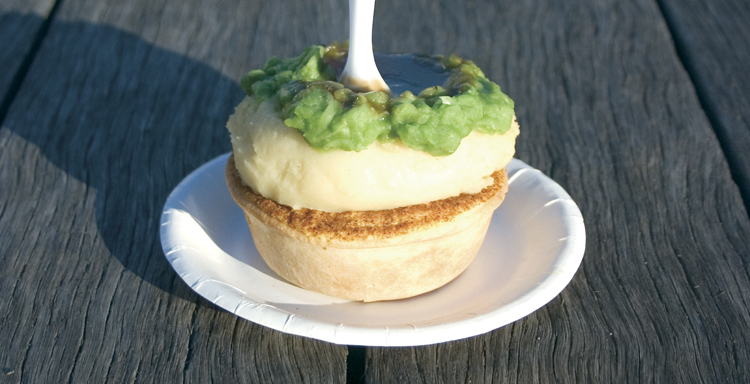 The Great Aussie Meat Pie Competition is a yearly event, part of the Fine Foods Festival held in Sydney or Melbourne. In 2005, this event had over 1,600 entries. Given this level of competition it is no mean feat to convince the 13 judges that your pie is the best on the block. According to John the perfect meat pie is one that has the right look, smell, taste and consistency. The flaky pastry should be light and golden, but strong enough to allow the pie to be eaten whilst being held in one hand. The meat should be prime beef, yielding a fragrant, succulent, warm brown filling that definitely does not need to be drowned in ketchup. As real oysters, so real pies. Au naturel. These boys definitely have a finger in the pie of success, and look set to continue the success of this great Aussie icon. Now Dubbo is a little too far for the traveller in Sydney with a space to fill and an hour to spare, so where does one go to find a sample of a great meat pie? Look no further than another icon of Sydney: Harry’s Café de Wheels. A mobile kiosk that has grown roots, Harry’s has been serving pies 24 hours a day on the Woolloomooloo waterfront for 60 years. An institution, with photographs of other rich and famous customers pinned to the walls, you can have a plain pie, or the haute-cuisine version – with a dollop of mash and another of mushy peas. Pie Heaven.